Place the flour, salt and sugar into the bowl of a mixer fitted with the paddle attachment. On a low speed, add the chilled butter and mix until it forms pea-sized balls. Add the cream cheese in portions and combine well. Place the dough onto a floured surface. Coat your hands with a little flour and flatten the dough into the shape of a square. With a rolling pin, roll flat to a 1-inch thick rectangle and then fold in the sides for a threeway fold – take one side and fold inward one third of the way and then repeat with the other side. Roll out again to 1-inch thick and fold both sides in again. Roll out to 1-inch thick and cut in two squares. Cover with plastic wrap and chill for 30 minutes. Place the goat cheese into the bowl of a mixer fitted with the paddle attachment. In a small sauce pot, add the white verjus and coriander seeds and bring to a boil. Add the golden raisins and then remove from heat. Let the raisins plump for 20 minutes. Drain and discard the liquid, and then add the raisins to the goat cheese. Add the toasted pine nuts, capers, olives and chopped parsley, chervil and chives. Mix on low speed and combine well. Working on a floured surface, pull out a portion of the empanada dough. Roll out flat, 1/8-inch thick. Cut out 2 1/2 to 3-inch rounds with a circle cutter. Brush an egg wash on the edges, then place two teaspoons of the filling in the middle. Fold over the dough to create a half-circle shape and enclose the filling. Use a fork to press and seal the edges closed. Place on a sheet pan lined with parchment paper. Repeat the process until all the filling is used. 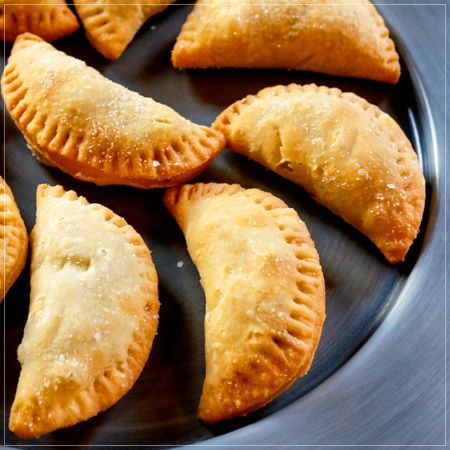 You can refrigerate or freeze the uncooked empanadas, which will keep for a month in the freezer. When you are ready to cook the empanadas, heat the vegetable oil to 350°F in a medium-sized pot. Place a few empanadas in the pot and fry until they are a beautiful golden brown. Set your finished empanadas on a paper towel to drain. 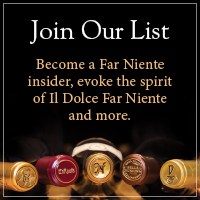 Enjoy with a glass of Far Niente Chardonnay!